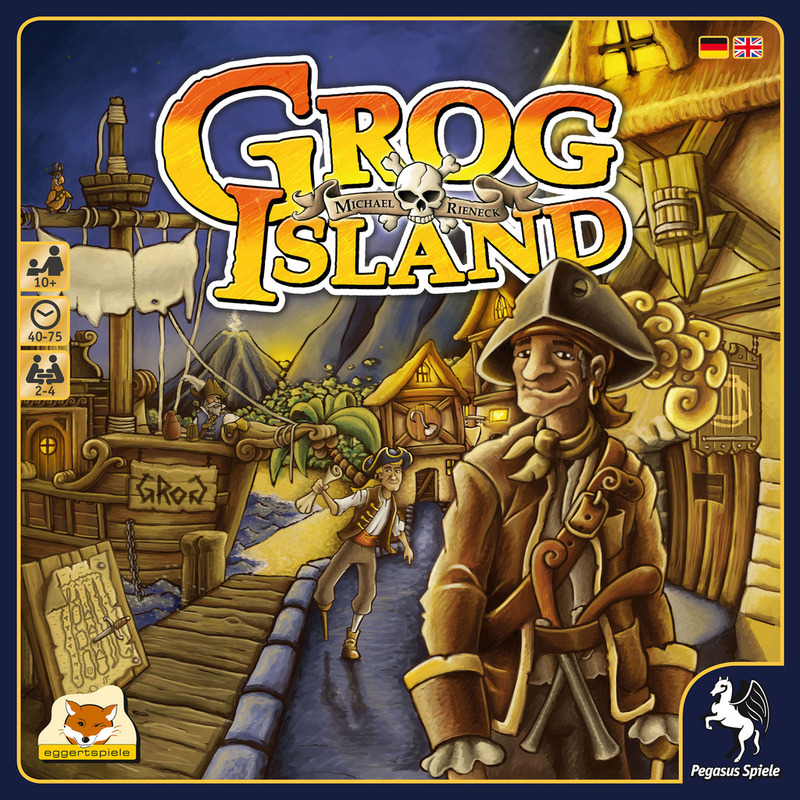 Grog Island is the newest release from Eggertspiele, a company currently riding high after winning the Spiel des Jahres last year with Camel Up. In Grog Island, players take on the role of retired pirates trying to convert their lives of plunder into solid business investments on the 5 peninsulas of said island. The large board shows these five peninsulas in the center of the board. Each of these peninsulas is a different color (yellow/gray/orange/blue/green) and matches up colorwise to a good and a die. Each of these peninsulas has 7 distinct buildings on it (out of a total of 12 types). Above each peninsula is a randomly dealt cloud tile which shows a special ability that will be associated with this peninsula for the entirety of the game. 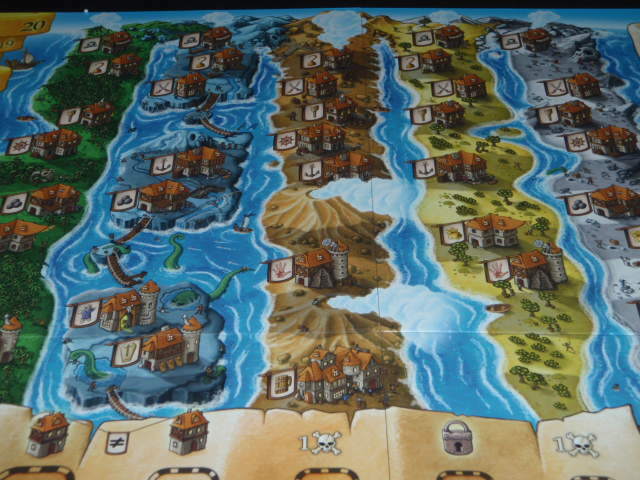 The middle section of the board is reserved for the bidding dice and the bottom of the board has the harbor for the island where the merchant ships can be found. At the start of the game, each player is dealt 6 goal cards – each of these can be converted to victory points at the end of the game if you can meet the criteria on the goal card. Each player keeps 4 of these cards and returns two to the bottom of the deck. 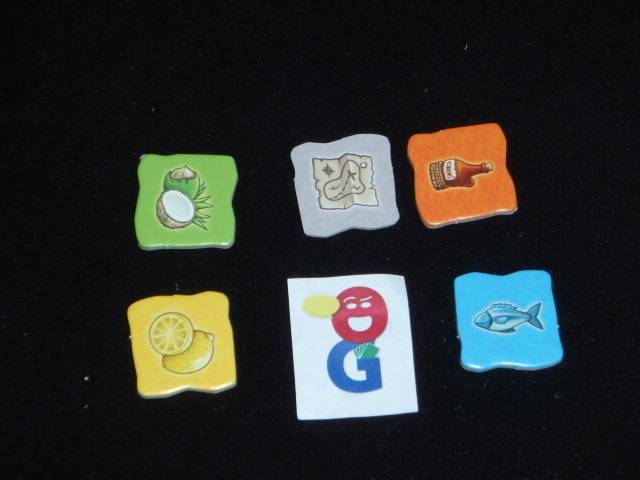 Also in setup, players receive one good tile of their choice, one treasure card (which shows a value between 1 and 3 gold pieces) and one parrot card. 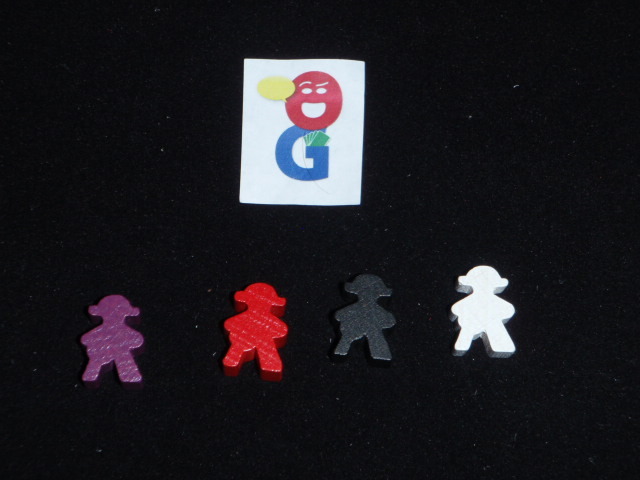 Each player also gets a supply of pegleg meeples (7 in a 4-player game). A player is given the start player marker. Finally, the six merchant ships are randomized and placed in the six spaces at the bottom of the board. In each round of the game, the start player will roll the dice and then use them to make a bid. In the lower center of the board, you will see the area where you make those bids. You choose from the rolled dice and place them in order from highest to lowest going left to right in the bidding area (there are a bunch of “greater than or equal” signs there to remind you of this). Your bid is actually the total of the pips on the dice placed in the bidding area, and if you win, you will have to pay a number of coins equal to your bid. The unused dice are placed on their matching color spaces underneath the bidding area. The majority of your treasure is known – there is a scale on the left side of the board showing your current coin holdings. However, you also have treasure cards in your hand which are worth somewhere between one and three coins. Therefore, the maximum you are allowed to bid is your coin total plus (treasure cards x 3). The bid then goes to the next player in turn order. If he wishes to make a bid, he must choose dice which have a higher total of pips. He can choose any or all of the rolled dice, but he must keep to the higher to lower order on the board. If he makes a higher bid, then play passes to the next player clockwise who then gets to choose what to do. The player could also choose to play a parrot card at this time – depending on the card, you might be able to re-roll a specific color die or you would be allowed to make a bid that matches the value of the previous bid. The player could also choose to pass and not increase the bid. If he passes, he first looks at the goods spaces beneath the bidding area and gets one goods marker for each goods icon visible (i.e. one good of each color in the current bid). Then, he examines the merchant ships at the bottom of the board. He chooses any available ship (i.e. not previous chosen) that he is able to supply – this means that he has at least one good pictured above the ship. He places his trade marker on the ship to show that this particular ship has been taken for this round. In any event, play continues around the board until only one person is left in the bidding – everyone else has passed, taken goods, and claimed a ship and performed at least on action on that ship. The player left standing therefore wins the bid that currently sits on the board. 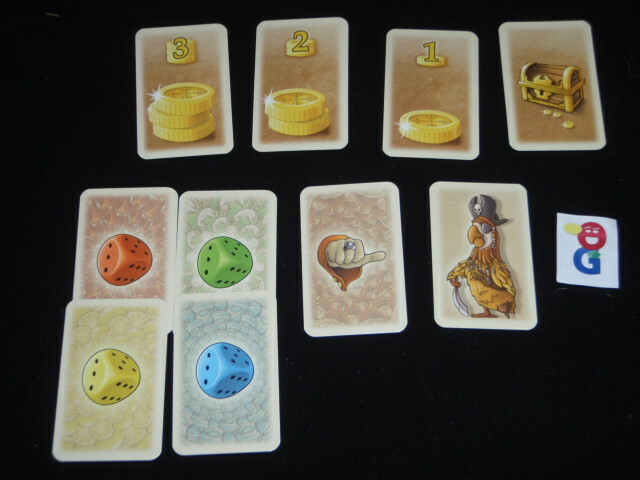 The player must then pay for his bid by expending a number of coins – either from the track on the board or from treasure cards – to match the number of pips in the bid. The player could choose not to pay the bid (usually only if he doesn’t have enough coins to pay for it) – and the only penalty is that this player gets no action for this turn. If the bid is successfully paid for, then the player takes the rewards for each of the bidding spaces which had a die in them. If you look above the 5 possible bid spaces, there is an icon above each space. For each filled space, you will take the appropriate action on the peninsula that matches the color of the die in that space. The first two spaces show an icon for claiming a building. To claim a building, you place one of your pegleg meeples on a building of your choice on the peninsula matching the color die in that space. If there is a white cloud above this particular peninsula, then you get an immediate bonus (a goal card, a VP, or a parrot card). Then, you also collect coins for buildings which are of the same type and are available (not already claimed by another player and without a lock marker on them). Usually, a winning bid will consist of at least two dice which means that you will be able to claim two buildings. When you do so, you may not choose the same type of building for both choices. The third and fifth spaces in the bid area gives you one VP each. Finally, the fourth space in the bid area allows you to place a lock marker on a building on the peninsula of matching color. This building must not yet be claimed by a player. The lock marker prevents anyone from claiming it for the rest of the game. Once the winning player has completed his turn, there is a bit of cleanup to set up for the next round. First, you see if the game is over – if at least one player has placed all of his pegleg meeples, then the game is over and you move to final scoring. However, if the game continues, all passing players take back their markers from the merchant ships. Then each merchant ship is shifted one space to the right (and the rightmost ship is picked up and placed on the leftmost space). Finally, the start player marker is passed clockwise to the next player. Again, if at least one player has played all of their meeples, there is a final scoring. The player with the most points wins. If there is a tie for points, the player with the most coins on the coin track wins. My family has enjoyed playing Grog Island – the bidding mechanism is a very intriguing mechanic indeed. The rules claim that this is a unique mechanism, and I have yet to come up with a similar one in my not-so-extensive research. There are a lot of moving pieces involved with the bids, both making a bid or choosing to pass. You constantly have to evaluate if you’re getting the actions you want in the color peninsula that you want. Or if you pass, are the current goods that you get and the availability of the ships may modify your willingness to bid or pass. The downside of this plethora of choices is that some turns can significantly slow down as players try to evaluate all of their choices – though in our game this was more of a possibility than a reality. In my first few games, it seemed like I was always focused on my money situation. 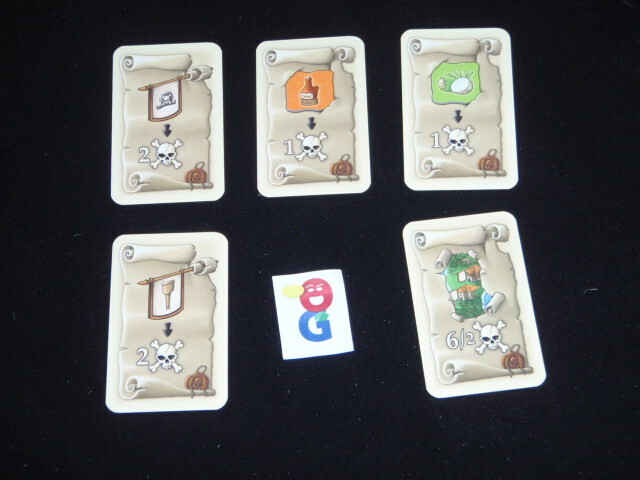 Each player starts the game with 8 coins on the track and one treasure card – and the way early bidding has gone in our games, the initial bid usually ends up close to the max possible of 11. Thus, whoever wins the bid ends up at the bottom of the stack money wise. Thus, that player must necessarily pass on the next couple of rounds of bidding and hopefully is able to use some of the merchant ships to trade in goods for gold coins, thus eventually allowing him to win another auction. For most of my games, all of the players have gone along this same financial yo-yo. There might be a particular round or two where you pass on an option to win a bid because the dice don’t match up to where you want to claim buildings, but it’s usually not too much longer before you’ll spend those coins that are burning a hole in your pocket! The majority of scoring does seem to come from the goal cards, and one of the really hard decisions to make when passing on a bid is whether to try to gain more coins or to try to use the one ship that allows you to draw more goal cards. You only get to add one goal card each time you use that ship, but that could end up being a huge swing in VPs. In my first two games, I underestimated the need to get more goal cards, and when the final scoring came around , I discovered that I really didn’t have much chance to win the game because I had such a limited ceiling of points. The artwork in the game is cartoony and I think meant to appeal to the family market. Icons are easy to identify and understand. 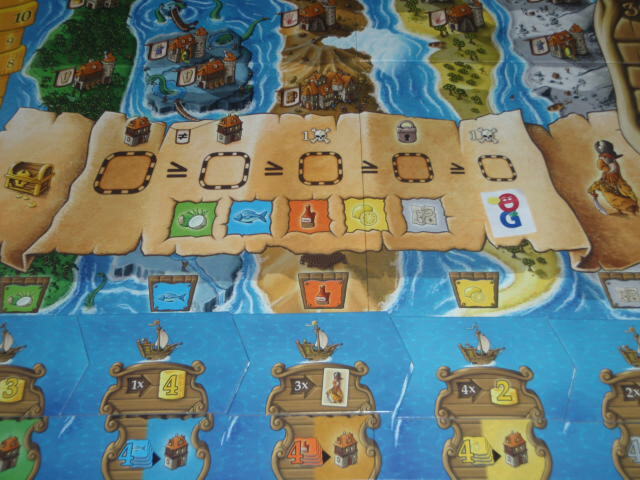 However, though Grog Island is a very well designed game; I think that it straddles the boundary between what I feel is a Spiel des Jahres level game and what has recently gone for the Kennerspiel. That is not to say that it isn’t a good game, because it is certainly one that I’ve enjoyed playing thus far – but it doesn’t strike me as an award winner because it’s a “tweener” – too complex for the SdJ but not quite enough for the Kennerspiel. That status, though, does make it a good fit for the lighter end of the spectrum for my game group and just right for my teenage boys and their friends. Ben McJ – I’ve only played once, but I found Grog Island to be a fine game that fell a little short of good. The auction mechanism was neat, and I would love to see it repurposed, but the surrounding game basically involved drawing secret goal cards and trying to do the things that those cards tell you to do. There is something inherently uninteresting to me in being led along by the game in such a way. I thought the artwork was adorable, and I disagree with Dale’s assessment that this is a tweener. I’d put it squarely in the Kennerspiel category (it’s at least as complicated as Istanbul), but I don’t see it being special enough to get a nomination. Joe Huber (1 play): Oddly, while my reaction was very similar to Ben’s, I was actually pleased to discovered this; initially I’d worried the game wouldn’t achieve what it does manage. On the whole, a pleasant game, with a sufficiently clever dice mechanism as to get on with – but without enough appeal as to warrant further play, at least for me.